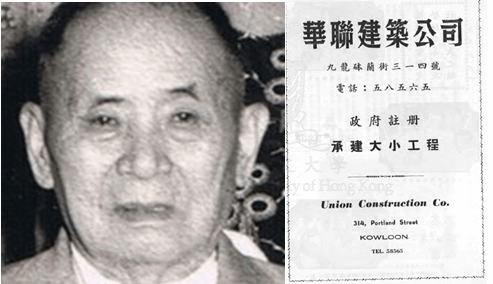 Earlier in the group, I wrote a series of articles on Shanghainese builders and in Part 7 of the series, the firm Union Contractors was misclassified as a Shanghainese builder as its proprietor Chan Bing-quan(陳炳鈞, 1924-1988) was born in Shanghai. As it turned out, his family is of Cantonese Hakka descent and his father Kew Chan (陳大球, 1882-1968, aka Chan Tai-kau), the founder of Union, was a co-founder of the Wai Yeung Merchants Association (僑港惠陽商會), an affinity group for Hakka immigrants from the Huiyang prefecture in Guangdong founded in the 1930s with hotelier Hui Yeung-shing (許讓成) of Park Hotel and fellow construction magnate Chung Yuk-hing (鍾玉興). According to a family tree uploaded to Geni, Kew Chan had at least four wives and 14 children.By the 1950s, he had handed the management of Union to Chan Bing-quan (aka Paul).Chan Bing-quan was born in Shanghai in 1924 and attended Pui Ching Middle School and St Joseph’s College in HK. He lived in 341 Braga Circuit in Kowloon and served as a director of HKBuilding Contractors Association during the 1960s. According to the billionaire Lui Che-Woo of the K. Wah Group, Union Contractors was a major contractor in the 1960s under the leadership of the second generation and it was thanks to the guarantee provided by Chan Bing-Quan to the US consulate that Lui was able to procure military surplus from the US Army in Okinawa for resale. Like Lui, Union Contractors was also in the quarry business with its quarry located at Tai Wan Shan (大環山) in Hunghom where it was engaging in reclamation work for the government and right next to the Green Island Cement factory. In December 1960, an accidental explosion of explosives killed 2 workers and injured one at the Tai Wan Shan site. Aside from Lui, Chan was also a business partner of Wong Wah-Sang of Chung Wah Shipbuilding, who supplied him with electric welding equipment. Union also did business in Borneo in conjunction with Dao Kee (see Shanghainese Builders Part 1 – Pre-War Pioneers for details on Dao Kee). In the 1980s, Chan Bing-quan migrated to Canada where he died in Burnaby in 1988. This article was first posted on 18th January 2019.